There is a defining moment in everyone’s life. Here is mine the Pie, I just cannot stop thinking about it. We saunter into The Oberoi Patisserie and Delicatessen ( a difficult word for the pastry shop), that’s me, dearest wife Praveen and Detective An. We look at the menus, order a brochette a portion of small stuffed croissants, some red cheddar (probably Leicester) a coca cola, a coffee and a magnificent Philadelphia cheese cake, we walk around and the pastry chef at the oven offers a pie (her name is Vidhu). She says, would you like a pie (in retrospect it sounds like would you like Nirvana). I said what kind; she says ham and cheese and mushroom and cheese. I am glad I said ham and cheese. She is also meddling with a sausage roll in the oven, I am distracted. No I stick to Ham and cheese. It arrives on the table in a rather small plate; the rest of the food is yet to arrive. I am entranced, the crust is nice and brown and crisp. The cheese is gruyere is gooey and sometimes stringy, the ham ooh, ooh the ham it’s the best I have ever eaten, soft and whispers to you like silk. 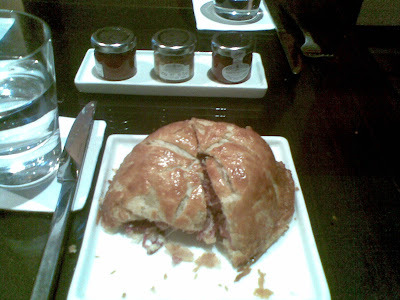 Amazing, crust, gooey cheese and strong ham, the flavors and textures are just too overpowering. Oh yeah! I could live like this. Accompanied by Wilkins Ketchup and Wilkins English mustard, which is grainy and nice. Me and Detective An immerse into the folds of the pies, while Dearest Praveen has a bite of just the crust. Pork has an effect of overpowering madness; the king of most meats, when made well can lead to momentary lapse of reason and delirium. That’s what I felt, so overwhelmed, I was dropping the oversized Cutlery all over the place. The Manager, Payal took the complements on behalf of Vidhu and informed us that they have different specials on most days. This magnificent dish (the humble pie) is Rs 511/- (inclusive of tax, The Oberoi very smartly prices nearly everything inclusive of a tax, albeit expensive, but you know what to finally expect. The Meal for all was 1850/- But the pie was worth it and more. If you have a moving food story that made the earth move for you, happy to hear it and host it. Mumbai has Café Samovar, Bangalore has Koshy’s, Kolkata…… well Flury’s in its older Avatar. All these chara cterize the city or render character to it. Working in a newspaper in the early 90’s and especially in an, nearly all women team had its advantages. They introduced me to eating places where the radicals, writers, artists and thinkers hung out then. Now the corporate suits, lawyers, lovers and an odd artist hang out. But, the food is nice. 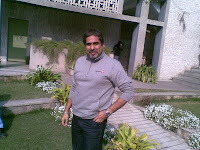 In the early and mid 90s, you saw Sudhir Dhar, the Cartoonist with HT, seated tall and alone at lunch nearly every day. I last saw him singing Carols with the kids in Richmond Park in Guragaon a few years ago. 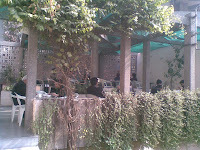 We went their then to be a part of the Fabindia fraternity, as a talisman of reverse snobbery rather than for the home cooked food that it Triveni Canteen/ Café and now Tea terrace offered. For someone who had parathas, gobhi, palak paneer, channa, rajma, kadhi as a regular menu at home. eating at Triveni was a Fabindia statement ( Fabindia was a very Delhi wallah brand then, Its nearly national now), smoking, fruit beer, or just beer, Hindi theatre at Copernicus marg, drinking copious quantities of Indian Whisky, knowing a few kebab joints, having a joint, knowing a friend with an apartment at KG Marg, going backstage to meet the caste of an English play, hanging out with Femina Miss India contenders, English movies at Archana and Chanakya, Kolhapuris, Kohl rimmed eyes for women, cotton saris, jeans, stencil shirts, gifting potted plants……. And holding hands (all seem passé now), but you get the drift of the Fabindia idiom. Now for our last experience On a Friday the Discovery Channel Alumni met at the bar Past Times at th e India habitat Centre. 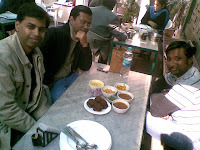 The next day, Saturday, the Alumni of Mint (the newspaper) met at the Triveni, Tea Terrace. In fact it was a stripped down version. People kept dropping out like nine pins, mother -in-law not well, have migraine, in a presentation with boss, just silence and no excuse. The four of us said what the heck, let’s eat. And eat we did. Throwing care to the winds we ordered, 4 plates of Shammi kebab, 2 keema and peas, 1 paneer bhurji, I Aloo Jeera, another Paneer bhurji and lots of rotis with a coffee each. It’s supposed to be an afternoon lunch in a budget, we in our ditched out state overcame with stuffing ourselves. The food was nice in fact too much; the keema had a rough and chunky texture. Rahul Verma of The Hindu (who I have mentioned earlier and is way ahead of the game on food writing, has reviewed Triveni before) said, its due to thefrozen keema which has not been thawed and cooked.We wiped the plates clean. Shot the breeze in the sun. It’s great place that fits into the under hundred rupees per head budget for the Salesman guide to eating out. Its another issue that we ate with vengeance and spent Rs 800/- for four persons (Rs200/- per head). 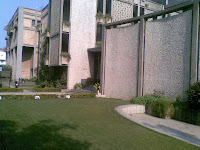 The place is more efficiently run by Meenu Singh. Kamla Rai the founder and the person who ran it for decades is her Aunt. Trivia : Triveni Kala Sangam was designed by Joseph Allen Stein and was made in 1963 under the able guidance of Mrs Sundari K Shridharani. The nook the book shop of rare collectible books, has shut down. The Tea Terrace is popular and life goes on. 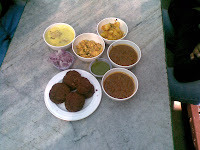 I am sure you have a favorite Triveni Story if you are a dilliwala or have visited the place. Love to hear it.